no-bake | What's Cooking at the Genua's? This recipe is one of John’s favorites. He likes to make it himself. We don’t use a crust with it because as anyone who knows John, carbs are a no-no for him. But feel free to use a prepared graham cracker crust if you like! When you don’t use the crust it’s also harder to have the cheesecake slices actually look like slices. So just be imaginative and pretend they are slices. They will actually be more like a creamy pudding like dessert. Either way it still tastes awesome and refreshing! We also use a sugar-substitute in this, sucralose (Splenda). You don’t have to. If you want to use real sugar the amounts are exactly the same. We also use light cream cheese, light sour cream and light or no sugar added whipped topping, but feel free to use the regular kind! 1. Beat the cream cheese until smooth with an electric mixer. Gradually beat in the sugar. Beat in the sour cream and vanilla until just combined. Fold in the whipped topping. Scrape mixture into a round pie dish. Chill for at least 4 hours in refrigerator. 2. 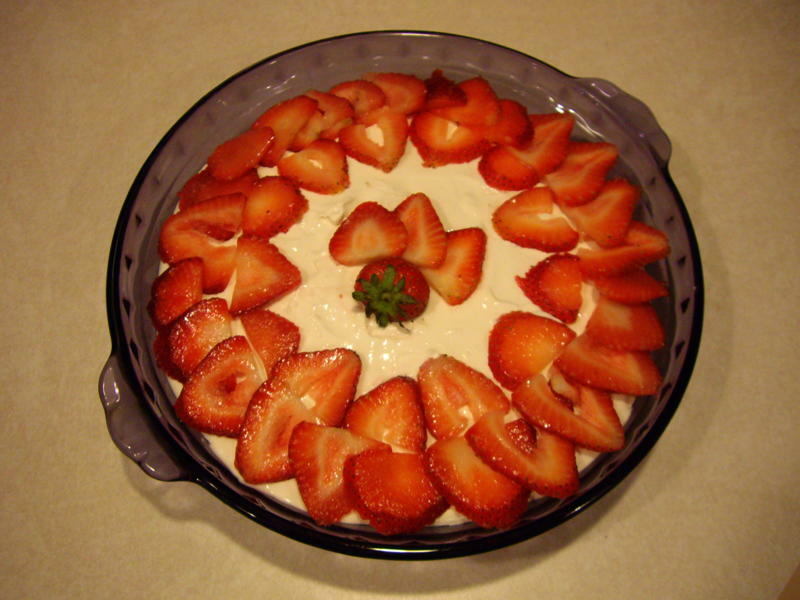 Once chilled arrange strawberry slices as you wish around the pie. You can fill the entire pie if you have enough strawberries. Serve! 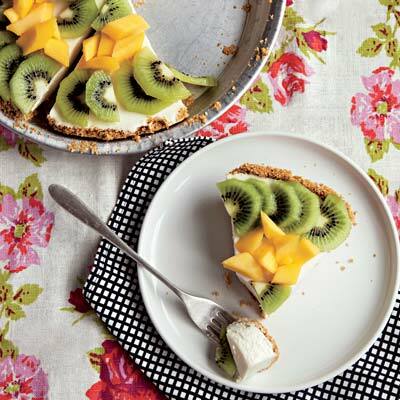 ** If you use all the fully loaded ingredients and a pie crust each slice would be about 450 calories and 26 grams of fat!! Our version still tastes great and with a lot fewer calories and fat!